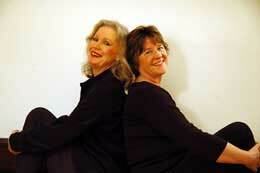 Folksingers Kathy & Carol return to the Freight for a CD release celebration marking the birthday of their brand new album, Keepsake. The duo is known for their exquisitely close, haunting harmonies, remarkable for the use of shifting intervals, dissonance, and unisons, which set them apart from other artists of the 1960s folk era. They toured with Mimi Farina and played with the likes of Pete Seeger and Arlo Guthrie, receiving even more attention after the release of their eponymously named 1965 Elektra album, a gorgeous tribute to traditional British Isles and American folk ballads. Tonight's concert includes Kathy & Carol songs both old and brand-spanking-new, with the focus on tunes from their recent release drawn from traditional music, the Carter Family canon, and Carol's fine originals. Join the duo for an evening of rich musical enjoyment.